Start reading Of Dice and Men on your Kindle in under a minute. So I’m glad I read this book, but let me explain what you get. Excellent history. Ewalt clearly did impeccable research, interviewing a lot of people, and all the big names of D&D are in here. He begins his tale long before D&D and even Chainmail, so it’s very thorough. Unfortunately he spends too much of the book retelling his own exploits as a player in campaigns, and anecdotes. This is fine if you genuinely have no experience or knowledge of how a roleplaying game works, but for those diehards among us, this gets old very fast and I ended up skipping all these bits. Be advised that 20% of this book is an overly detailed index. That’s a lot of wasted space. He also doesn’t tell the whole story of Wizards of the Coast, instead foisting us off to a web link. Lazy. I’d rather have had that story than the index, because as I said, his retelling of the actual history is extremely well done. I’d also have liked to see more about other TSR games, like the classic Star Frontiers. I also wish he’d included photographs. That would have been fantastic. All in all, a great history, but padded in my opinion, especially considering the ebook price. Dungeons and Dragons type of gaming has become ubiquitous in our culture. Street gang-bangers communicate "Rolling Twenties" in their graffiti to signify a thing going perfectly well. D&D has become a gateway to philosophy and contemplation to a generation of men, and to lesser extent, women, who start thinking about life and reality within the framework of gaming. A lot of good writing can be done on this subject, but this book is not it. This book purports to be the story of D&D and people who play it, but it skips over a lot, and what it brings to mention, it glosses over. How Gygax lost control over his creation, and his business relationships with the Blumes and Williams is a fascinating question and a cautionary tale. If you do enough on-line research, you can get a fairly decent picture of that disaster. When professional journalist does it, especially a former business magazine editor like David Ewalt, I expect insights greater than what I can retrieve from public Internet. Instead, Ewalt glosses over Gygax and Williams in positive light and whitewashes their questionable actions, if he mentions them at all. In fact, Lorraine Williams was a shark looking for a publishing company to promote her family franchise (Buck Rogers), as evidenced by fact that almost from get-go she entered into secret negotiations with the Blumes to purchase their shares of the company. Gygax himself was no angel. All of the would-be historians of D&D tend to ignore the fact that by some accounts, Gygax was abrasive to Don Kaye's wife and has turned her against him with his boorish attitudes towards women (apparently). At the beginning of Chapter 14, Ewalt mentions an invitation that he got from the Wizards of the Coast to unveil their D&D Next (5th Edition). This invitation referred to him as "...trusted press partner and a respected member of the D&D community." Wizards of the Coast are diabolical marketers, not that I criticize them for it, they are in business of making money and they have to promote their product. They are innovative to match the gargantuan size of TSR of yore. With their Fifth Edition, they have instituted what is in essence a training program, where game store owners get D&D 5th Ed. materials and run in-store game sessions to teach their customers how to play it. This is great innovative marketing, but what of their Press Partners? And what is a NON-Trusted Press Partner? A professional journalist who does his or her job, maintains objectivity and hides nothing? Than what would be a "Trusted Press Partner"? A PR Stooge? Historically, TSR attempted to be the Standard Oil of the role-playing games and Dungeons and Dragons was its wildly successful brand. It wasn’t just a game. It was actually a way of playing fantasy role-playing, an efficient gaming format and a design paradigm that overshadowed other, mostly indie role-playing games, which evolved with the times and introduced newer and more innovative gaming concepts, while D&D game mechanics changed and evolved a lot less. Ewalt posits this book about to be D&D specifically, and so indie games like Dust Devils and Little Fears are outside his scope. However, Ewalt mentions in passing that Wizards of the Coast (and he) believe that the six editions of D&D (White Box, Basic, AD&D, AD&D Second Edition, 3.5 and 4) are actually different games. It would have been interesting to read just how these six game styles differ among each other, but Ewalt does not say much. Ewalt mentions failed competitors to D&D, such as Tunnels and Trolls, and a book similar to Monster Manual, that Chaosium published, but fails to write about Chaosium's Runequest, and other competitors to Dungeons & Dragons, such as Chivalry and Sorcery, Pendragon, and Man, Myth & Magic, that ultimately failed to get market share, and some, such as C&S, started imitating D&D. What these other games were all about, how they differed from D&D as well as why they did not succeed, would have made for some fascinating reading, alas the subject matter for a different book and a different author! In the beginning of the book, Ewalt declares that he plays the 3.5 Edition of the game and tells off any possible gamer, who might argue, claiming this book to be for non-gamers. He then spends entire page 214 arguing the virtues of the new D&D 5th edition over 3.5. Who are his intended audience? Another thing that I didn't like was that Ewalt kept referring to himself as a Nerd and to D&D gaming as a Nerd pastime. Initially, I thought that this was a conceit, where he was mugging for compliments. Ewalt is all over You Tube, lecturing and giving talks and speeches, like some sort of an Elder Statesman of D&D. He is fit, well dressed, and can talk to an audience, anything but a Nerd. Then, the more he dwells on this subject as his book goes on, it becomes clear, just how much Ewalt must have internalized the social class structure and its values. The home D&D game that he is using as an example of D&D play throughout this book, essentially pits progressive warrior liberators of humanity against capitalist (his own words) Vampire oppressors, who pen humanity in cages and use it as food. The players in his group too, can be described as the creative elite - a performance artist, a would-be screen-play writer, a non-profit social work exec, etc. One of the players in my game has encountered Ewalt and three other players mentioned in this book at a public game at a store in Manhattan, New York. Her remembers them well. They intimidated him in a way that my friend does not understand. He couldn’t explain to me what it was about them that made him nervous. The first game session nobody talked to him, other than gaming. Second session, one of the players talked to him and pumped him for information, finding out that my player is a delivery man. Just a delivery man. Not a day job, not a temporary job. Only a full-time job that my friend was doing all his life to support himself after dropping out of high school and failing to join the Army or get a City job. The third game session, they dropped him like a hot potato. Progressives. 3.0 out of 5 starsToo much memoir of play sessions not enough biography/history of D&D. Too much memoir not enough biography/history. As an owner of a gaming store I've had plenty of occasions where someone tells me their favorite moments from an RPG campaign. It's always more interesting to the speaker than the listener because role play is so personal. This is where the book falls down: Ewalt relates sessions of playing with his friends in every chapter sort of as a narrative arch for the book? I really don't care and appreciated those first person accounts of their gaming session being in italics so i could skip it and get onto the good stuff, the reason i bought the book. Yet this brings up the second failing. After a thorough history of the creation of D&D and first years, he just starts to fast forward over the rise and fall of TSR, the purchase by Wizards, and how D&D came back with d20 and 3.0/3.5. 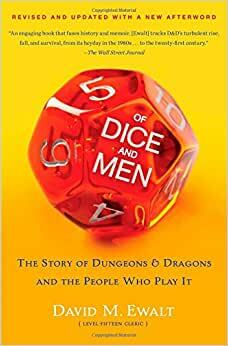 I wanted the whole business/biographical story of D&D, i got a pretty good origin story and then some highlights after AD&D. It's like he or the publisher got tired of working on it and just wanted to ship it. It's too bad, because the decline of TSR, the transition to Wizards, then the fan revolt over 4th edition would be great stories with important life/business lessons in them, even if just what not to do. This is much more a story of Gary Gygax than it is D&D.